If you are a military veteran that needs legal assistance in the area of Discharge Upgrades, you may contact one of the listed legal resources. AMVETS Legal Clinic provides pro bono representation to military personnel and Veterans. They provide legal representation on issues ranging from Discharge Upgrades, Traumatic Service Group Life Insurance Appeals, VA Benefits Appeals, and issues arising under the Service Members Civil Relief Act. Veterans Legal Institute (VLI) provides pro bono legal assistance to homeless, at risk, disabled and low income current and former service members so to eradicate barriers to housing, healthcare, education, and employment and foster self-sufficiency. VLI also advocates on behalf of its clients by providing community education and policy advocacy in an effort to increase awareness, resources, and overall protections to current and former members of the US military. The Veterans Pro Bono Legal Clinic provides legal services at not cost to Veterans or their families. We not only help Veterans with Veterans Pension and Aid and Attendance, but we also help Veterans with claims for Service Connected Disability, benefits related to Agent Orange Exposure, PTSD and TBI. 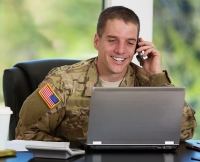 Discharge upgrades, Educational Benefits, and paperwork for VA Home Loans. The Veterans Justice Center is a special program of the Legal Aid Foundation of Los Angeles, under the umbrella of its Government Benefits legal area. Created in 2000, the Project?s goal is to protect veterans and their families by securing government benefits, and medical care and services, while stabilizing their living situation. It is open to every veteran who is at risk for homelessness as a result of problems obtaining benefits. The Project?s located at LAFLA?s East Los Angeles Office. CLA-LA is a nonprofit 501(c)(3) corporation, and we assist clients regardless of their religion, race, color, creed, national original, ancestry, disability, gender, sexual orientation or age. Clients, however, must satisfy our income guidelines, derived from California's housing guidelines for very low income families in Los Angeles. For example, in 2012, very low income means that a single person cannot earn more than $29,550 on an annual basis. Please contact us for more information about our income guidelines. ICLC’s Homeless Veterans Project specializes in psychological trauma claims, especially Post Traumatic Stress Disorder (PTSD) arising from combat or Military Sexual Trauma (MST). If you are a veteran and need assistance with obtaining compensation, health care, or other benefits from the Veterans Administration, please attend one of our clinics at the following locations.